Can’t find a restaurant in your area that sells it? 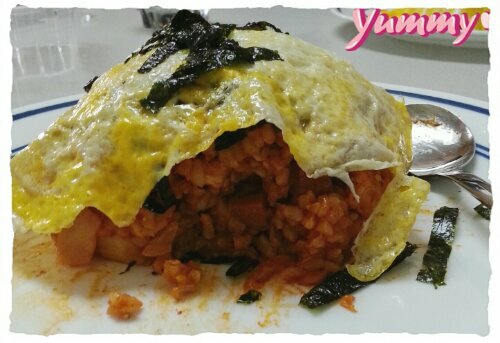 Here is a simple recipe to making your own kimchi fried rice. About 3 cups of cooked rice. About 1/2 cups of kimchi and squeeze the juices and set it aside. Chop your kimchi into small chunks. Get a frying pan and pour a good amount of veg oil that covers the whole pan evenly. Wait for it to heat up and dump your chopped kimchi in and stir for about 1 minute. Then throw in the rice and juice and red pepper paste (found in most not all asian supermarkets) and stir! When everything looks nicely mixed, pour 1 ts or less of sesame oil. It is ok to completely omit the sesame oil if you don’t like it. Stir until all of your rice is evenly covered with the color red. And voilà!! Home-made kimchi fried rice! Optional fry up an egg and place on top of your kimchi fried rice.